I haven't gotten flowers in years. I am highly allergic to them. I did finally tell my husband several months ago that I really missed getting flowers and suggested that maybe he still send them to me and I throw them away that night. A girl can at least enjoy them for a day, right? 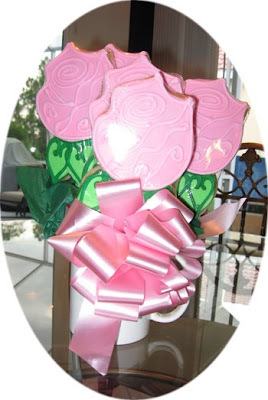 Well, sweet sweet Hubby, sent me Cookie Roses! So I got to have my Flowers and Eat them too! :-) They were very good! And, I have to say I was quite excited about this creative idea.